Each week, ESPN FC projects and reviews the scoring battle between Lionel Messi and Cristiano Ronaldo in La Liga. Cristiano Ronaldo netted the winner in El Clasico and, in doing so, increased his goals advantage over Lionel Messi in La Liga to seven. Ronaldo got just two of his five shots on target but his final effort was decisive as it clinched Real Madrid's impressive come-from-behind victory. Messi, meanwhile, got just one of three shots on goal as Barcelona were beaten for the first time in 39 games in all competitions. Cristiano Ronaldo has scored 10 goals in his last eight league games. Here's what our Real Madrid and Barcelona club bloggers had to say about each man's performance. Ed Alvarez on Ronaldo: 8/10 -- Up until the 85th minute, his performance had been a mixed bag including two great shots and several failed attempts to dribble Barcelona defenders. However, after listening -- somewhat justly -- that he had not scored in big matches, he chose one of the biggest events of the season to hit the winner in such a calm, composed manner that it seemed he had no pressure over his shoulders. This goal will mean a lot for the Portuguese striker in terms of confidence. Francesc Tomas on Messi: 5/10 -- The five-time Ballon d'Or winner was not as influential as Cules would have hoped for. Could have scored with a sublime chipped shot shortly after the break, but Keylor Navas responded with a frustratingly superb save. All in all, however, Messi's inability to get regularly involved in his team's attacking transitions resulted in the world's best player delivering a substandard performance. Lionel Messi has not scored against Real Madrid since 2014. How did Twitter react to Ronaldo and Messi's latest displays? What do you think about Messi and Ronaldo? 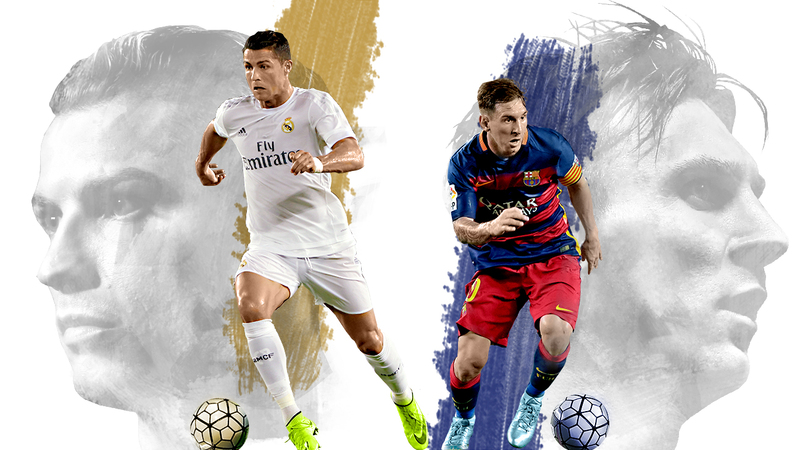 Let us know using the hashtag #ESPNFCMessiRonaldo. Plus, tell us who will win this season's scoring battle in our poll. After midweek Champions League action, Ronaldo and Real Madrid host Eibar on Saturday. Later the same day, Messi and Barcelona visit Real Sociedad. All season long, ESPN FC, in conjunction with ESPN's Stats & Info group, will forecast the scoring battle in La Liga between Messi and Ronaldo using a specially designed projection model. "These projections account for the historical performance [goals scored and minutes played] of the two players since 2010, strength of opposing defences faced [measured by SPI defensive rating], game location, and the potential for injury or missing games. Based on these inputs, the predictor will estimate the chance of each player scoring any number of goals for each remaining game. From this, we can project the total number of goals scored, hat tricks, and the chance of each player accruing more goals than the other over the course of the entire Liga season."